With Battle: LA opening this week, we thought we'd present some of the more memorable alien invasion-themed comic stories of the Golden Age. These days, this story would be a six-issue mini-series with tie-ins to several other titles. The rest of the book was made up of unrelated reprints from earlier issues of Planet Comics. While the interior artist is unidentified in the Grand Comics Database, it looks, IMHO, like either the pencils or inks were by Mort Meskin. The cover was done by Maurice Whitman, one of Fiction House's more prolific artists. When the book was reprinted in 1958, yet another cover was done (see left), featuring totally different-looking characters and flying saucers that appeared nowhere in the story! 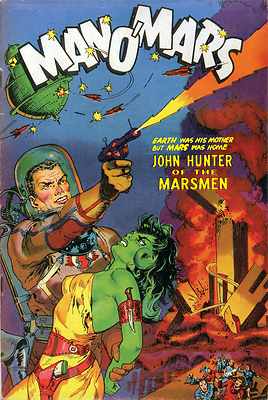 We included the original cover as part of our Martians! Martians! Martians! retro collectibles line including mugs, t-shirts and other nifty stuff. There's lots of vintage alien invasion-themed stuff there, as well as at SpaceMan Jet and the SpaceBusters (whom we'll also be presenting in the Reading Room Annex this week), and Quatermass: the Man Who Inspired the X-Files! Keep checking back for more alien fun..and Watch the Skies! Video Fridays: Battle LA Alien Invasion Special! Video Fridays: GREEN HORNET Goodies! The Coming of the Courageous Captain!